The transformation of the product designer’s role … progresses through three stages. In the first part of my series on applied UX strategy, I outlined a UX maturity framework. Parts 2–4 of this series provided in-depth coverage of some operational and tactical aspects of implementing UX strategy, including requirements for product designers, employing platform thinking to ship quality products, setting up a design team, and creating a design culture. Now, I’ll begin my discussion of how to solve business problems through design. Everybody would be happier if product designers could translate user painpoints into the language of business…. Product designers fight for users every day, but they often use arguments that do not speak effectively to product managers, citing design best practices and guidelines, case studies from other companies, or even aesthetic principles. Most product managers are not capable of applying such knowledge to their products. Laura Martini gives a great analogy: Finance teams do not say they create spreadsheets for a living. Recruiters don’t say they write email messages and make phone calls. Rather, these professionals talk about the value they provide to their company—the healthy finances and solid teams that are necessary for a company’s growth. Everybody would be happier if product designers could translate user painpoints into the language of business instead of arguing endlessly. 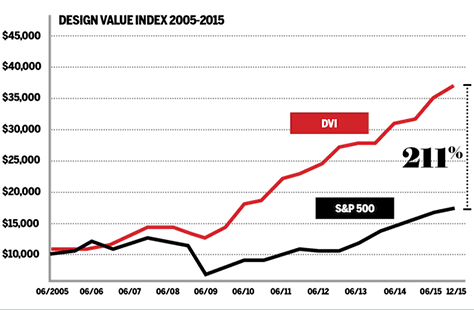 The Design Value Index (DVI), shown in Figure 1, is a market capitalization–weighted index, comprising design-conscious companies, which shows remarkable 10-year returns of 211% or more over that of the Standard & Poor’s 500 (S&P 500) index for the same period. Bloomberg cross-referenced the American Customer Satisfaction Index and the stock-market performance of 190 major brands in 2013. 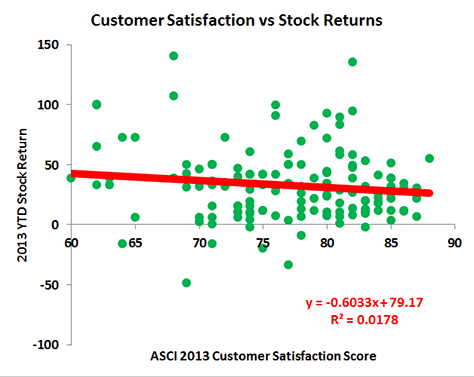 In the diagram shown in Figure 2, you can see the correlation between customer satisfaction and high stock returns. In highly competitive business-to-consumer (B2C) markets, product and service quality are important to market success. However, if sales depend on business customers rather than actual users—as in monopolistic industries, products for government, and enterprise software—other market principles are at work. Moreover, product quality is often a long-term investment, so a product company wouldn’t see a quick return on that investment. Thus, the successes of other businesses that work on different market principles may not be relevant to your company. Product designers should sensibly assess their current situation and understand where design can bring value to a business. Beyond producing design solutions of decent quality and meeting their deadlines, product designers’ core responsibility is solving business problems. While it is, of course, important that product designers be good at design, they can offer much greater value to businesses if they can help them make better product decisions or identify new growth opportunities. 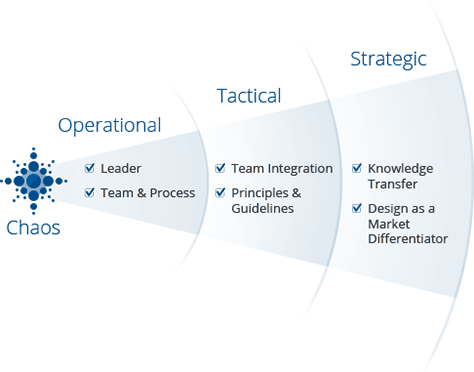 As Figure 3 shows, product designers who take on a more strategic role function at a higher maturity level. They determine where a company is going and, thus, have a much greater impact on its success than specialists who function only at an operational level—how good they are at their job—or a tactical level—the efficiency of the product-development process. Strategic designers influence the what and the why at their company. While product designers must solve basic problems at the operational and tactical levels…, to increase the authority of the Design team, influence product direction, and avoid accruing design debt, it’s necessary to fight for a more strategic role. Product designers often complain that they’re not included in product-definition discussions. In such cases, requirements come from product managers, while designers just produce mockups. Often this is a sign of the immaturity of a company and its leadership, but sometimes this happens because of the weakness and short-sightedness of the designers themselves. While product designers must solve basic problems at the operational and tactical levels—as I discussed in Parts 2–4 of this series—to increase the authority of the Design team, influence product direction, and avoid accruing design debt, it’s necessary to fight for a more strategic role. Of course, it’s important to demonstrate the value of good design, but UX professionals also have a deep understanding of users’ needs, and product managers need their insights to make good decisions. Once they understand the value that UX professionals can provide, they’ll start expecting them to do more than just produce deliverables. According to Bobby Ghoshal of WeWork, 80% of design happens during meetings or pitches, in board rooms, or when you’re getting engineers and product owners to buy into your ideas, not when you’re doing pixel-pushing. By envisioning and selling the future, UX designers can solve more impactful problems. 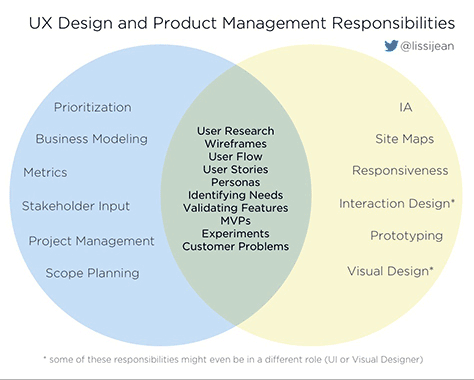 In Figure 4, Melissa Perri and Scott Sehlhorst show that major responsibilities of product managers and UX designers overlap. Some of these responsibilities are about producing familiar deliverables. However, the most important responsibility is solving customer problems. Key opportunities for design teams that want to become more mature and strategic include discovering user problems and identifying the value of solving them; understanding users’ goals, contexts, motivations, and capabilities, as well as the business’s product strategy, competitive positioning, stakeholders, product ecosystems, and organizational capabilities. By envisioning and selling the future, UX designers can solve more impactful problems. Product development has become more and more dynamic over the past 10 to 15 years, and there are both more iterative and more conservative approaches. In the real world, the first steps of this idealized process often get abbreviated to a ready-made product plan. Figure 6 shows one highly iterative approach. Involving product designers during all three stage radically increases the value of the designers. 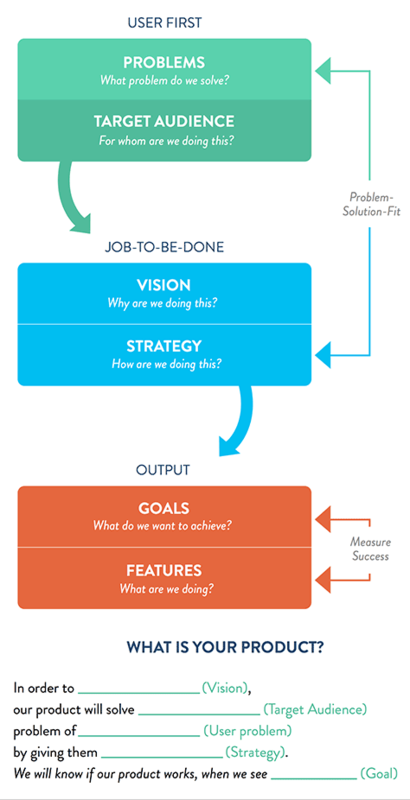 We can view these goals through a problem → solution → validation prism. The tools and methods that UX professionals have mastered let a product team look at a product through this prism more effectively. At many companies, projects integrate designers only at the final stage, adding usability testing to the process. Doing usability testing is relatively easy and outcomes have high visibility. However, involving product designers during all three stage radically increases the value of the designers. Jobs to Be Done (JTBD) is a popular method of describing users’ problems. Jobs-to-be-done stories … define specific life situations that cause users problems … that users are willing to pay to solve. Whenever a company launches a new product or evolves an existing one, it should start with unsolved user problems. If a potential target audience is big enough and can be monetized, a company can propose a worthwhile product that will deliver business value. What does a product manager do at this stage? learning about users and their needs—User-research methods such as ethnographic studies, interviews, surveys, diary studies, focus groups, and analytics can provide insights on the importance of particular user problems, as well as data about the target audience, including segmentation, behavior, motivation, context, mental and consumption models, expectations, fears, and prejudices. conducting a competitive analysis—Comparative usability testing, expert and heuristic reviews, and the aforementioned user-research methods show how other companies are solving similar user problems and what aspects users consider important. Jobs to Be Done (JTBD) is a popular method of describing users’ problems. 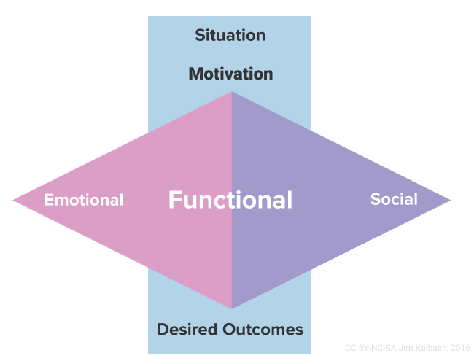 Jobs-to-be-done stories like that shown in Figure 7 define specific life situations that cause users problems—whether functional, emotional, or social problems—that users are willing to pay to solve. (HubSpot describes a similar approach to discovering potential user problems.) Figures 8 and 9 show the jobs-to-be-done model that Intercom uses. Jim Kalbach has also written about applying this method to the definition of digital products. Figure 10 shows his jobs-to-be-done model. 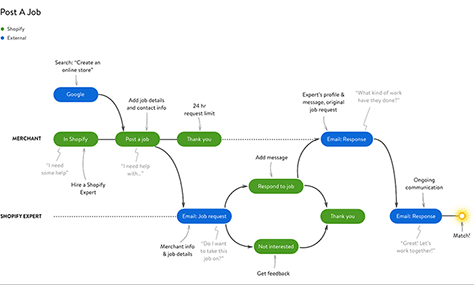 You can also use Jobs to Be Done (JTBD) to segment users according to their needs. While UX designers have typically used personas for this purpose, this tool has recently lost its charm. It’s rare for companies to be able use personas effectively throughout the whole product-development lifecycle—rather than just at the beginning. Moreover, JTBD delivers a sharper focus on user problems, while too many examples of personas focus too much on describing fabricated rather than research-based personal characteristics of users. A focus on solving users’ problems is a better approach to eliciting product ideas. Nevertheless, personas are still a great tool for building empathy for users across a product-development team. Plus, if the user segmentation for a product is distinctive, combining personas with JTBD can be a great approach. 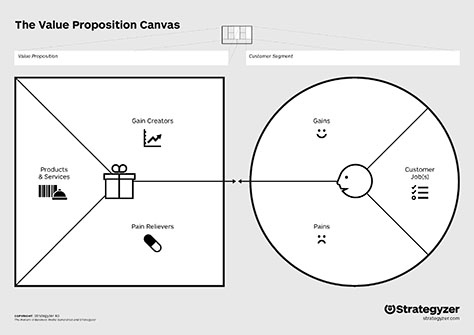 Another way of looking at both user portraits, or personas, and their problems is the Value Proposition Canvas, shown in Figure 11, which depicts how a business plans to solve user problems by offering specific valuable propositions. 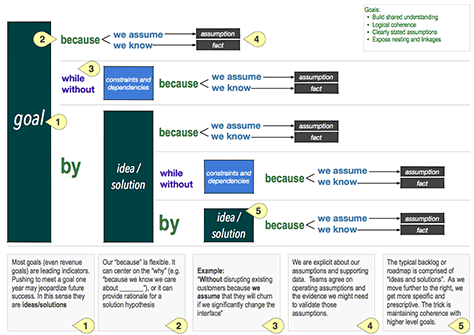 Good tools for analyzing user problems visually are the customer journey map, which shows how people use a product, and the experience map, which takes a broader look at solving a user’s life problems. 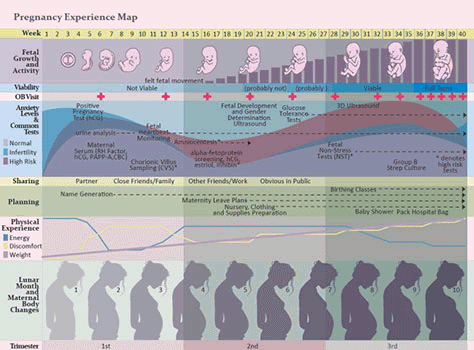 Figure 12 shows an example of a customer journey map; Figure 13, an example of an experience map. Designers can teach product managers how to use these tools—although the most progressive among them already use them. 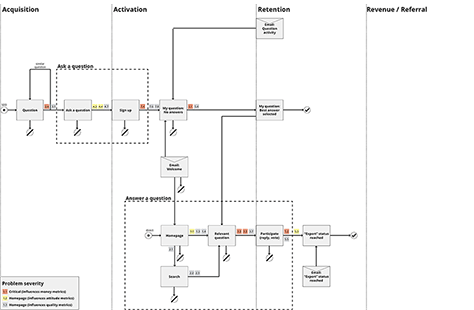 Service blueprint diagrams show how a service company operates backstage as well. Experience-mapping experts believe that complete semantic accuracy is not necessary. The key thing is to make these maps work in the context of your product-development process. These types of maps can show how users currently solve their problems—whether by using a specific product or independent of any product—the key steps in a user scenario, and positive and negative moments and touchpoints. They can include a full cycle of user acquisition—from early awareness to active usage and recommendations to friends—or just a user’s interaction with a single significant part of a service. For a new product, a map could present its key features; for an existing product, it could show bottlenecks that a company might solve to enhance the product. Such maps cover not only the digital parts of a product or service, but also supplementary services in other offline channels. Maps offer a deeper look at user problems, providing many insights that can help a product team make good decisions. 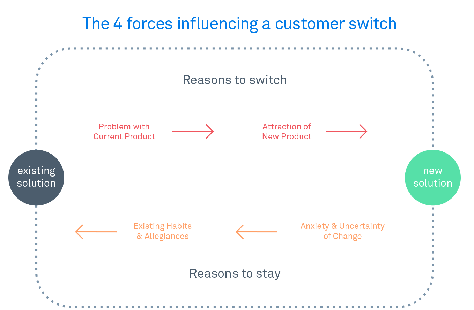 Customer journey maps do not need to be as complex or polished as the examples shown in Figures 12 and 13. 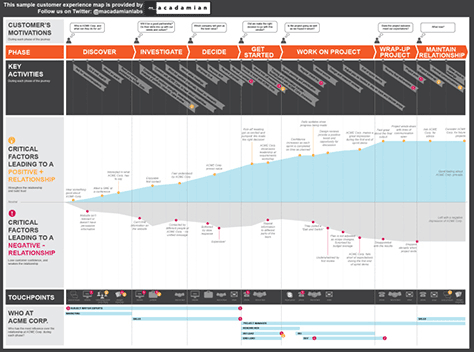 A customer journey map’s main job is to help designers and product managers visualize user problems, so you can keep a journey map simple like that shown in Figure 14. However, an experience outcome may depend on the complexity of product-usage scenarios. So it may be better to map just a single landing page rather than create a more holistic customer journey map. If a product handles lots of atomic scenarios—for example, Internet search—you should include user behavior segmentation and complex analytics. In reality, companies often see a market opportunity and just try to launch a product quickly, then improve it iteratively, so they don’t worry about understanding their users till later. Companies often cut corners and skip user-research activities. However, as any product grows, it becomes apparent that it’s important for a company to know its users. Any product manager will have to get answers these questions sooner or later. As the focus of mature companies moves from solving to identifying problems, they can’t accomplish much without knowing their users. Hypothesis validation is one of the main roles in which product designers can be helpful. Once a product team has explored a problem and deemed its importance and value to users sufficiently significant, a product manager must propose a solution for the target audience. What does a product manager do at this stage? assessing user attitudes toward a product idea—Although users can hardly evaluate their interest in a product at the very early stages of product development, before a company has even created a prototype, UX professionals can use survey and interview methods to understand their interest in a product concept. validating hypotheses through a solution prototype—There is a wide spectrum of cheap methods for validating hypotheses, including static and interactive prototypes and pseudo-automated services such as Wizard-of-Oz order processing. UX professionals test a prototype, then iteratively enhance it; conduct qualitative interviews and usability testing; and employ quantitative approaches such as using analytics on a limited-audience launch or to compare several different versions of a solution. Hypothesis validation is one of the main roles in which product designers can be helpful. This is more true than ever thanks to design-thinking practices becoming increasingly popular and companies thinking with their hands by prototyping interactive solutions. 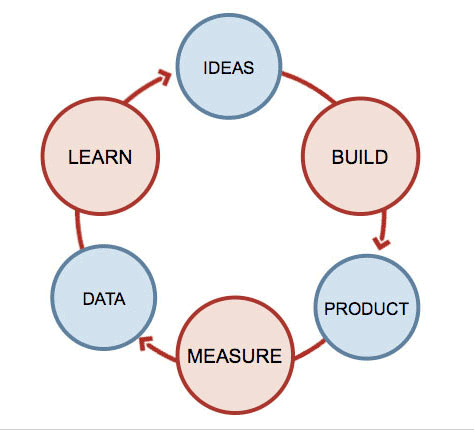 The Lean Startup and Lean UX approaches have made quick, iterative design cycles at earlier stages even more important. Designers should formulate hypotheses before proposing solutions, then validate their hypotheses. A problem definition is just one type of hypothesis. How can designers be sure that a design concept really solves a user problem? They should define an experiment that can validate or invalidate the hypothesis. 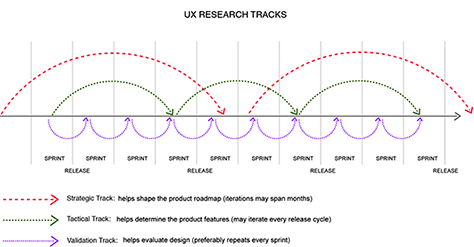 UX researchers should determine an approach to testing, considering what users should see a design concept and how; what success metrics—such as analytical data or user-research methods—would prove the hypothesis; and the minimal feature set that would enable the usage scenarios a concept supports. Developing and testing hypotheses is often primarily a product manager’s job. However, in a company with a high level of UX maturity, the UX team should play an integral role in the process of developing and testing hypotheses. John Cutler has proposed an interesting approach to defining hypotheses, as depicted in Figure 15. UX professionals possess many methods for validating hypotheses. A prototype can have different levels of fidelity, depending on the type of hypothesis, the team’s level of understanding of the product and its users, and the phase in the product-development process—from rough wireframes for key scenario steps to a clickable prototype with real data that fully elaborates a customer journey map. Nikkel Blaase has used an interesting format for determining problem / solution fit, shown in Figure 16. Usability testing, expert and heuristic evaluations, and analytics can help designers to test their hypotheses and discover problems. Either when a product is close to launch or immediately after launch, a product manager should make sure that the quality of the product is sufficient and that users understand how to use it and are satisfied with the experience outcome. What does a product manager do at this stage? initial hypothesis validation—Is there market demand and does the solution solve business problems. How good are key metrics? Does a product meet initial user expectations, as well as those that are shaped by marketing efforts? product-quality assessment—Is the product functionally stable? Does the product have all necessary features and user-interface elements? Do users understand the conceptual model on which the user interface is based? product-evolution plan—This plan includes a prioritized list of user problems and solutions for them, as well as a schedule for implementing updates. discovering product problems—Usability testing, expert and heuristic evaluations, and analytics can help designers to test their hypotheses and discover problems. prioritizing problems by business and user value—Designers can choose the most critical problems to solve using several criteria, including usability—which they assess through qualitative usability testing and metrics such task times and error rates—and user appeal. They can identify product problems that occur during specific user scenarios, which is helpful in choosing optimal solutions. 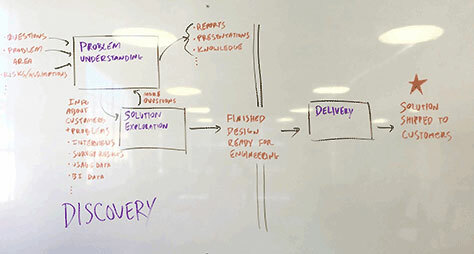 validating design solutions—Designers again formulate hypotheses and run experiments to solve problems. A design team should track whether the design enhancements they propose get added to the product roadmap. However, the team can’t test or analyze all their hypotheses. Therefore, it is important to balance the amount of knowledge the team will gain from user research and the time and resources it requires. Sometimes teams must rely on expert opinion, so being able to deliver your design arguments effectively is a critical skill. In Creativity Inc., Ed Catmull says many take the hackneyed phrase “you can’t manage what you can’t measure” too literally. There are many hidden patterns and unintended consequences in any data set. Sometimes we have only assumptions even though they’re based on data. 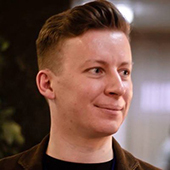 Taylor Palmer believes that a product team should look upon any design activities as learning activities, so thinks of design tools for prototyping as learning tools. 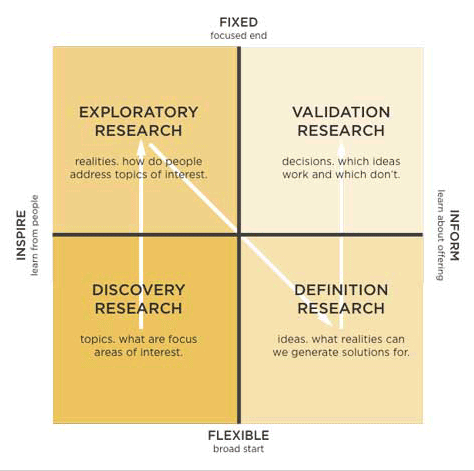 Meena Kothandaraman and Zarla Ludin propose a good user research–methods map, which identifies the best methods for particular purposes, as shown in Figure 17. 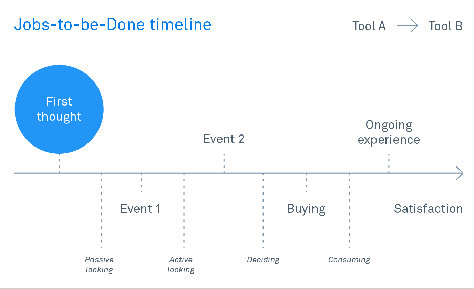 Designers can also use a customer journey map to visualize how a product works and determine which problems to solve first. They can identify the product problems that arise during particular usage scenarios, as shown in Figure 18. Then, the product team can choose the most valuable problems to solve. It’s very helpful for designers to mark problems and insights on the map. Whether creating a customer journey map from scratch or adding problems and insights to one, it’s best to work collaboratively with a product manager. Doing so will give you a shared understanding of how the product works. Scott Sehlhorst and 3M have shared their thoughts on this approach. 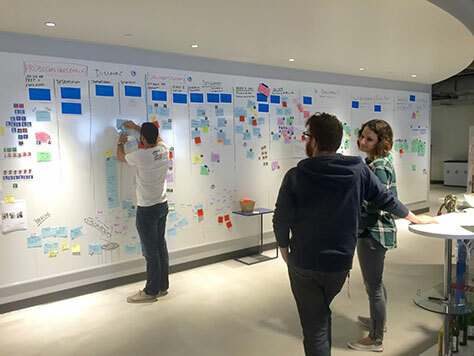 Optimizely has proposed a great way of organizing the work of an internal design team throughout the product-development process—from identifying problems to proposing solutions and validating them. They created a special Kanban board, shown in Figures 19 and 20, that lets the team explore problems and solutions gradually. validation—proving or refuting assumptions or design decisions, identifying usability and accessibility issues, and measuring user satisfaction and emotional response. Great work on pulling all this together! I personally think user problems are a great way to represent user reality—better than bigger constructs such as personas. As for the business, the finding of Figure 2 feels really shabby. The level of correlation is so low that, although it’s statistically significant, it is meaningless. The variation is explained by factors other than customer satisfaction. Of course, proponents of modern measures such as NPS or CES would probably argue that these measures are wrong.